Best Chicken Liver I've ever had. Perfect breading, perfectly cooked. Why have a fish stick when you can have a delicious fish log!! I have ate here for almost 40 years and now I take my little son there. I love the food and people. I also was able to fish there for years, but not anymore. You should try the chicken livers and fish log way to go. Thanks Lake Nina for not changing something that wasn't broke. My family and I just ate here for the first time. It was delicious. The atmosphere was fun and friendly. My husband and I had the fish log and I had the hot slaw as well. We can't wait to go back. I loved the very relaxed atmosphere. The view of the lake was awesome and the food delicious. My husband and I had chicken livers and they were made exactly right! Worth the drive from Columbus. Great food, great service, great view of the lake! Amazing hot slaw. The absolute best food!! Enjoy the patio in good weather. Inside views of the lake! Gorgeous! Large portions, but offer smaller portions for smaller appetites. This is the whole fish log. Scrumptious! Food was ok. Clientele and service were abysmal. Fish log and chicken liver dinners are good. Loved the coleslaw here. seafood and the scene at this spot is very good. Service is always nice even when they have a full house. Bring your appetite because portions are filling. Menu is like a place in San Francisco I loved. Their fish is the best! Light, flaky and melt in your mouth with the perfect coating for frying it right. The grilled chicken was simple, moist and delicious! All the staff help you feel welcomed and taken care of with 💘. We visit regularly! Good food at reasonable price. This time my order was messed up and I got the wrong sandwich. Plus. Best Hot Slaw ever!! 👍🏻😋 Fun atmosphere on the weekends and a beautiful lake on the property. Good food. Good value. Good service. first time here...loved the lake side view even on this rainy day! verrryyy friendly hospitality, generous portions of food, fish was amazing! ( trying either the grilled fish or fried chicken next time) family friendly, all around cute family ran business. we will be back for sure. Usually I get the fish long, but this time I tried the minnow portion and the jack salmon, walleye. Usually I get the fish long, but this time I tried the minnow portion and the jack salmon, walleye. It was pretty big for a minnow portion! The breading was very good and the fish was nice and flaky! My sides were hot slaw and mashed potatoes. All homemade! Can’t beat the prices on the food or the drinks. Staff is super friendly. They have a dining room that overlooks the lake or you can sit in the bar area. Food came out fresh and hot definitely one of my favorite restaurants now. This place has the best fried fish you will ever eat. Make sure to get the hot slaw and home fries, too! Love this place! It has great food! Best Fish Log and Frog Legs around! Me&my girlfriend HEIDI&our friends Gary&stef&her dad. We went there for dinner&had a great time&their food was 👍 GREAT!! Quaint cozy place with excellent food at a fair price and wonderful attentive wait staff. Highly recommend you try it! Good food, friendly service, and very casual atmosphere. This is not a fine dining experience but it's an enjoyable evening of good food with friends. This place is amazing! They have a full bar friendly atmosphere and the food is seriously so good! I can not wait to go back. You can also sit and look out at the lake while you enjoy your meal. Great food , Great people!!!!!!!!!! Great fish, needs a choice of breads. Wouldn't help to expand with bigger kitchen. But nice place to go to overlook the lake while you eat. Good food and even better prices! The service is the very best. The fish log is definitely the very best anywhere. AND the chicken livers are so tender and top notch. A must place to go for a great meal. Awesome food but staff noy very friendly! Our family went there for years. Outstanding food. Food was excellent. A fun time with friends. I took my two grandsons to Lake Nina for lunch, we had a great time. Great menu, the staff was super friendly. The back room has a wonderful view over the lake. 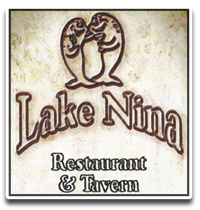 We look forward to visiting Lake Nina again. The food was really good, but the service was terrible. We had a large group gathering there after my mother's funeral on a Saturday. The waitresses were inattentive and actually had attitude. I was disappointed. This was almost a month ago, and I'm just now getting to posting my review. Clearly it's still on my mind. Best Fish logs and hot slaw, great food overall. Fish log and hot slaw was very goooood!!! !